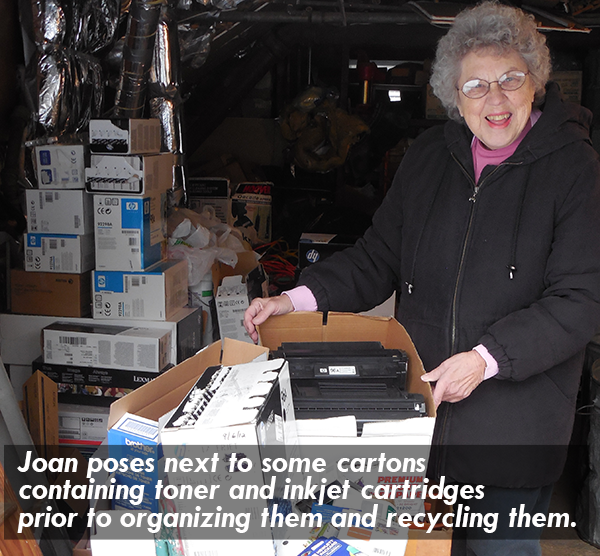 “I am very happy to recycle toner and inkjet cartridges as well as cell phones for both the Woman’s Club of Denville/Rockaway and the Mt. Pleasant Animal Shelter. By doing so, these items are kept out of the garbage, and some funds are raised for the two groups,” says Joan. This go-getter has rescued and recycled many more items over a period of many years: fabric, yarn, old clothes, small appliances, and plastic six-pack holders. In 2012, she collected more than 3,500 pairs of “retired” eyeglasses and donated them to New Eyes for the Needy and other nonprofit organizations. Joan volunteers at Denville’s Rid Litter Day, at Rockaway Borough’s twice-a-year townwide cleanups, and assists with the rummage sales at the Community Church in Denville. She also works with members of the Denville Senior Citizens Chapter I to collect coupons, and visits Denville social services weekly with donated items for the food closet. “Bob is extremely dedicated. He just goes the extra mile for everyone and is passionate about what he does,” affirms Ralph Blakeslee, Netcong administrator. Bob has helped Chris Vidal, assistant recycling specialist at the MCMUA, reach out to Netcong businesses who have delivered trash mixed with recyclables or entire loads of mandated recyclable material, such as corrugated cardboard, to the transfer station. When Chris visits one of those businesses alone and she reports back to Bob, he is very thankful and appreciative. He happily posted single-stream recycling signs at the recycling depot very soon after receiving them, and every year he tries to track down as much tonnage documentation as possible to include it in the annual recycling tonnage report. 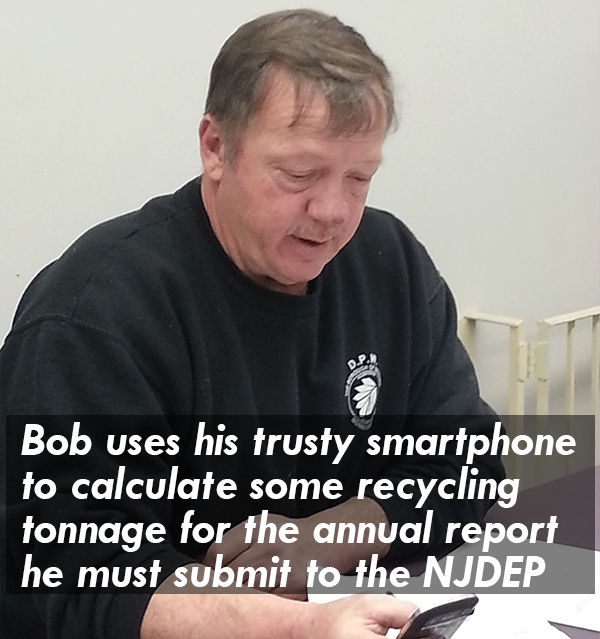 Having worked for Netcong for 37 years, Bob is constantly striving to improve the recycling program. Al is a “hands on” recycling coordinator who takes his responsibilities very seriously. 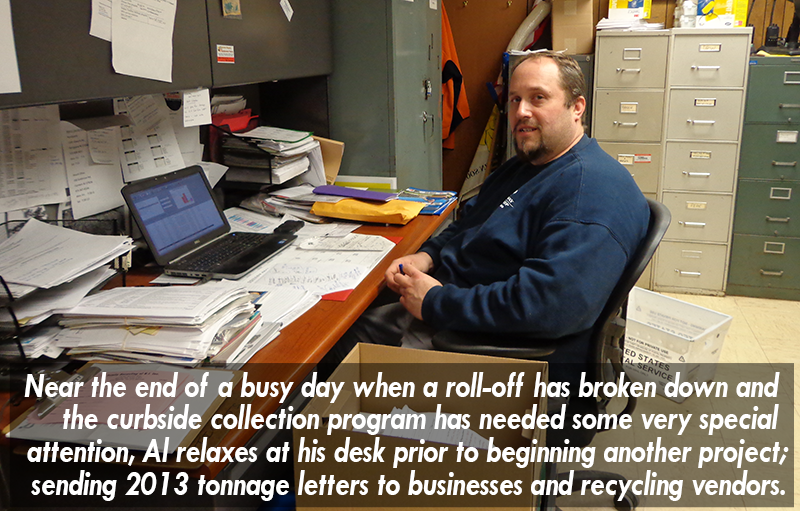 When Al learns that a Rockaway Township business has been written up for not recycling during an inspection at one of the transfer stations, he provides the business with educational information about recycling and also offers that business the opportunity to use the municipal recycling depot, which further encourages the business to recycle properly. He is well aware that if all of the businesses recycle as the law requires them to do, the Rockaway Township tonnage figures will increase. In addition to tending to his many other duties, he is updating and strengthening the municipal solid waste ordinance. “I’m proud of both the monthly and yearly increases in tonnage,” Al says, “and pleased about the positive response from children who are taught to recycle in school.” Al is just one of several coordinators who faithfully attend the quarterly meetings for Morris County municipal recycling coordinators. “Tim puts on his gloves and hat to be sure that residents understand what the recycling laws are,” says Stephanie Gorman, his co-worker. And what are the specifics? 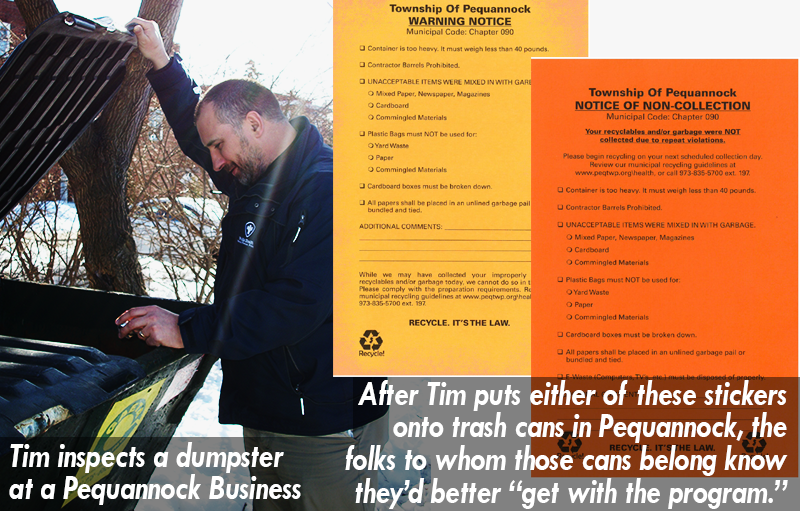 Since November 2011, Tim has gone out at 6 a.m. on Tuesdays and Fridays, trash collection days in Pequannock, to inspect household trash. Unafraid to get his gloved hands dirty, Tim looks into every trash receptacle to see if any recyclables have inadvertently (!) landed there. If that is the case, he puts a fluorescent orange-colored sticker (WARNING NOTICE) onto the receptacle. Weeks later, he returns to that non-compliant residence to conduct another inspection; if he sees recyclables inside the trash receptacle, he puts a deep orange-colored sticker (NOTICE OF NON-COLLECTION) onto the receptacle. Recently, Tim has been inspecting trash containers at local businesses, too. After two full years of “rummaging” through trash cans, Pequannock’s recycling tonnage has increased from 32.38% to 36.96% (27.77 tons). “Because I have two children, it’s important to me to help keep the Earth a clean place on which to grow up,” Tim notes. 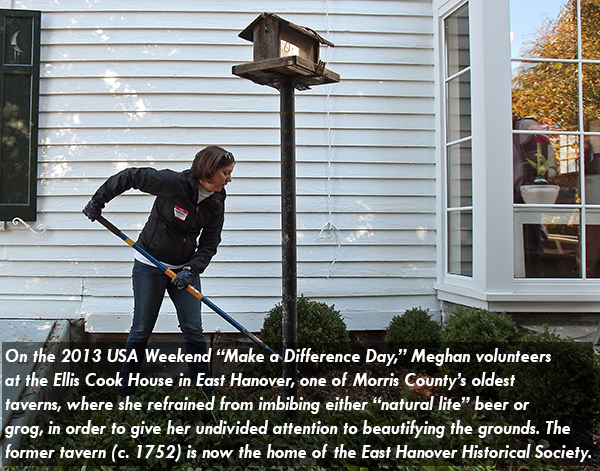 In Meghan’s very own words: “‘Grassroots’ launched on August 24, 2011, to bring to life stories of how Morris County residents connect with the natural world and each other. We have spotlighted countless citizen scientists, activists, nonprofits, businesses, and more, on the grassroots level of the growing sustainability movement. That has been my pleasure – truly. As an avid hiker, novice gardener, and vegetable lover, I feel lucky that I have the opportunity to share my passion for all things sustainable with readers. Connecting with farmers, artists, and artisans, has been both fun and something I take very seriously. I have always believed that all it takes to make the place you live a better place is a desire to explore it. That curiosity often leads to wanting to learn more about it, then loving it and fighting to protect it.” Of note: Today was Meghan’s last day at the Daily Record. At the end of this month, she will become the communications and events manager for the Geraldine R. Dodge Foundation in Morristown. Best wishes to Meghan on the next leg of her “natural lite” journey through the sustainability realm. According to the online encyclopedia Wikipedia, “‘The medium is the message’ is a phrase [clause?] coined by Marshall McLuhan meaning that the form of a medium embeds itself in the message, creating a symbiotic relationship by which the medium influences how the message is perceived.” So there. For quite a few years, various MCMUA staff members have been interviewed about litter abatement; the proper disposal of household hazardous waste, recyclables, and trash; the Pedals for Progress bicycle collection program; the boat shrink-wrap collection program; and the recycling awards dinners (the message) by Joe Garifo, Morris County public information officer, who hosts the cable TV show Focus on Morris County (the medium). The taping of Focus… interviews has been done since February 1991 at the County College of Morris (CCM) Media Center. “Everyone associated with the CCM Media Center has lent his and her creativity and expertise to the production of Focus On Morris County. Their assistance and professionalism have been invaluable. They have enabled the Morris County Board of Chosen Freeholders to better inform county residents of the many county government services that this county offers. It is a real pleasure working with them,” says Joe. 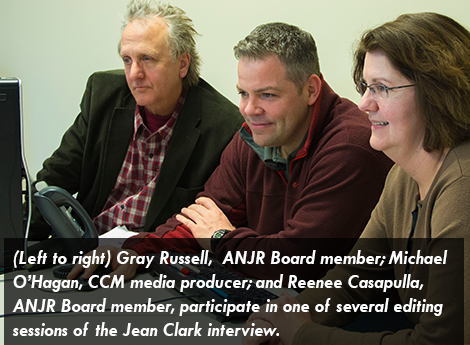 Quite recently, Michael O’Hagan, media producer, taped and edited an interview of Jean Clark, a prime mover in the early years of recycling in New Jersey; that interview (the medium) is titled The Roots of Recycling in New Jersey, Reminiscing With Jean Clark, the Grande Dame of Recycling (the message) that premiered on March 27, 2014, at the 2014 annual meeting of the Association of New Jersey Recyclers (ANJR). 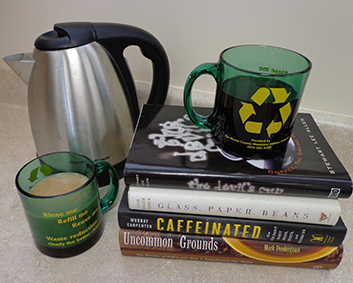 Joe Schilp, associate director at the media center has pointed out that in the past two years, the separation of materials to be recycled has been quite evident at the center. Because of the upgrading of equipment and technology there, copper from the insides of old audio and video cable, as well as sheet metal from racks and cabinetry that had been used to house equipment, has been kept out of the trash in order to be recycled. 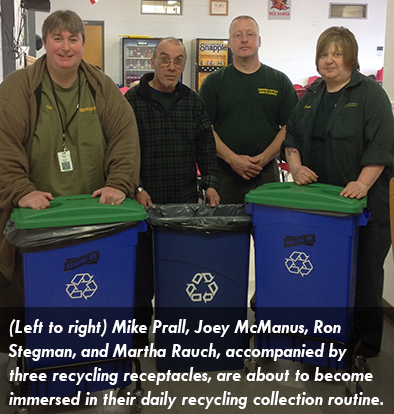 “Media Center staff are proud to play a role in making our county a cleaner environment,” Joe says. Erin Colfax, Naomi’s research advisor and teacher at Morristown High School for the past four years, who also mentored her in Biology and Research Science I/II, writes the following about Naomi: “Naomi is a believer. She believes that by changing the way we approach research and writing about scientific advancements, we can change the course of our future. Naomi looks for the gaps in scientific research and strives to generate research studies that focus on connecting knowledge in new ways. Naomi exhibits multiple strengths as a young scientist; she is hard working, passionate, well read, and intrinsically motivated. 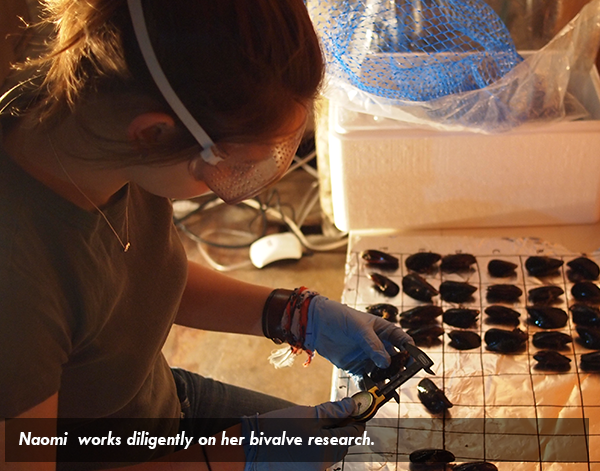 During our time together, she expanded her knowledge in protocol and grant writing, and put these practices to work by designing two research investigations that studied the combined effects of temperature and pH on specific bivalves of the Atlantic Ocean. She has spent a considerable number of hours researching, designing, and field-testing her ideas, and…her efforts have been some of the most stellar in my 13-year career. She engages in research because she can see the global impact that her work could have on the scientific community.” Naomi, herself, reflects on her research and its relationship to recycling: “My research hasn’t had one central focus over the years, and I see that as a positive: I’ve learned about ocean acidification, rising water levels, and aquaculture in great depth. My environmental science teacher’s presentation [about the Texas-sized collection of plastic in the Pacific Ocean] affected me so much because I realized that if we can remove bottles,cans, and pieces of plastic from our waterways, we can focus our efforts on the more pressing and unpredictable issues that I had studied. Recycling, unlike the theoretical and untested solutions to curb climate change or oil spills, is a relatively simple solution with guaranteed and far-reaching results. By recycling, we can not only reduce the growing vortexes of garbage in our oceans, but we can create sustainable and useful products for future generations; everything from park benches to toothbrushes to jewelry can be made from recycled plastic. I have grown to appreciate my family’s humble recycling efforts, and I have encouraged my friends and neighbors to do the same, because I know that with more work, Texas might just shrink to the size of Morris County.” Naomi has been accepted at the University of Pennsylvania, where she expects to major in biology or environmental science. Do you remember seeing the message “You’ve tried the rest, now try the best” printed on the top of a pizza box? 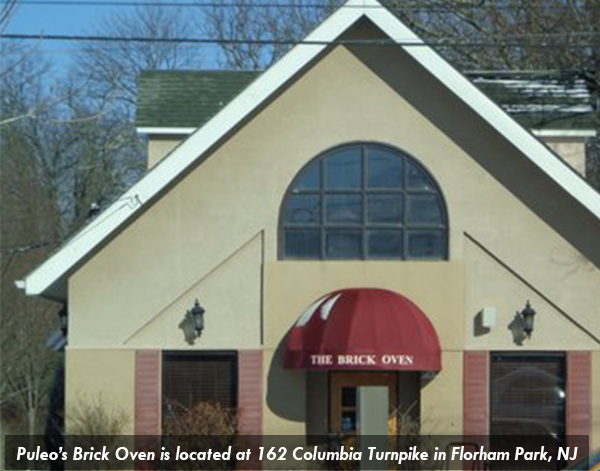 Well, that expression is similar to the name of the award for Puleo’s Brick Oven in Florham Park. The Puleo’s story began about two years ago when owner Chuck Puleo looked at his trash bill and decided it was too high, whereupon he called his hauler who said there wasn’t much that could be done because the tipping fee for trash was so high. Chuck then took a proactive stand and said he’d just have to search for another hauler who would be able to help him. Shortly thereafter, that same hauler (ahem…) suggested that Puleo’s implement a single-stream recycling program for bottles, cans, and paper, and that Puleo’s also keep food waste separate from the trash in order to be recycled. Chuck welcomed the suggestions, after which a representative from the hauling company even visited the 23-table restaurant and spoke to its 12 employees about the implementation of the new recycling program. After the recycling program had been in effect for a while, Chuck was delighted to see that his trash bills had been cut in half! The single-stream receptacle is larger than the trash dumpster because of the quantity of wine bottles, plastic beverage bottles, food cans, and various types of paper that are being recycled. Cooking oil is recycled, too. “It’s been so easy and non-invasive to recycle. After we started to recycle, it became routine for the entire staff. I feel that the little bit we do helps the environment,” notes Chuck. If you’d like to sample some insalata mista della casa or some fettuccini con portobelli or even a mystery dish called le pizze alla margherita and later check out some recycling receptacles at a small business that’s recycling very well, Puleo’s is the place to go! An easily overlooked, but important part of sustainability is purchasing quality furniture and home décor. 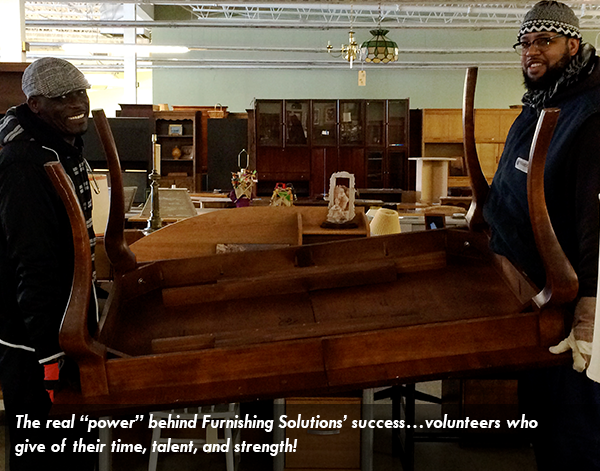 Furnishing Solutions, a unique resale store that opened in the autumn of 2012 offers an eclectic mix of gently used items donated by members of the community. Furnishing Solutions is committed to reducing landfill-bound waste by encouraging customers to repurpose and upcycle, even offering workshops for those interested in do-it-yourself projects. All proceeds directly benefit the ongoing mission of Homeless Solutions, Inc., the parent nonprofit organization serving families and individuals in the Morris County area with sheltering needs. The store, which is located at 2960 Route 10 West (in Powder Mill Plaza), Morris Plains, is a light and airy place that is chock-a-block with attractive living room and dining room arrangements, and much more. Both Blake Cook and Donna Miller, who share the job of managing Furnishing Solutions, agree that it is a great project. “We’re helping lots of younger people acquire nice furniture at reasonable prices that will last forever,” says Blake. Her colleague Donna chimes in, “It’s for such a good cause. Many people are involved; in fact, some of our customers have been so delighted with Furnishing Solutions that they’ve become volunteers here, and it’s a win-win for the Earth.” Furnishing Solutions owns a 16-foot box truck that three part-time employees drive on three days each week to residences within a 15-20 mile radius of the store to pick up furniture, artwork and pictures, lighting, housewares, bookshelves, decorative items, rugs, mirrors, and jewelry. Printed on the sides of the truck is the following: what goes around comes around. Indeed. For more information about Furnishing Solutions, visit www.furnishingsolutions.org. 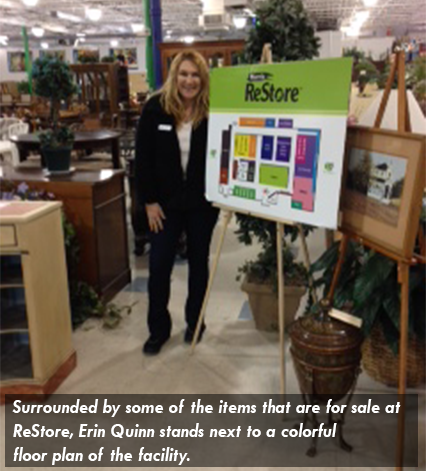 Since its opening in 2007, one of the major goals of the ReStore has been to keep items out of landfills. To date, it has succeeded in preventing over 3,700 tons of merchandise from landing there. Over time, the ReStore has expanded its focus to include the public in terms of helping to educate, encourage and promote ways to ReCycle, ReThink, and ReDo. It has done so by hosting a “Go Green, Save Green Day” each October for the past three years, when additional savings on already discounted merchandise and the presence of five to eight vendors offering a wide array of “green” talents, ideas and/or products are available. Participants are able to donate old cell phones, electronics, eyeglasses, clothing, inkjet and toner cartridges, and even blood! In addition, ReStore has developed partnerships with organizations such as College Hunks Hauling Junk and 1-800-Got-Junk, who deliver reusable items to ReStore rather than to take them to a landfill. Rick Osteberg, ReStore director, estimates that such partnerships have resulted in approximately 48 truckloads a year or 70-100 tons of merchandise sold at the ReStore. Also, ReStore has begun to work with other nonprofit agencies to identify families who need help with furnishing their homes. These families are invited to visit the store on “Give Away Day,” a specific day on which they may take what they need from a selection of merchandise. “Donating to and shopping at our ReStore is a meaningful way to support recycling in our communities. This helps support our mission in providing affordable housing to our community [to date, ReStore has helped to build eight homes],” says Erin Quinn, ReStore retail operations manager. For more information about ReStore, visit www.morrisrestore.org. The Hy Nadel Creativity Award was established in 2010 in memory of Herman (Hy) Nadel, who was a member of the MCMUA Board for over 17 years, including six years as chairman and three years as vice chairman. Besides serving as a board member, Hy, who was also known as the Cake Man, contributed to the MCMUA by baking and decorating 18 sheet cakes for the recycling awards dinners between 1991 and 2008; each cake was a work of art, featuring a design related to the theme of that year’s dinner. 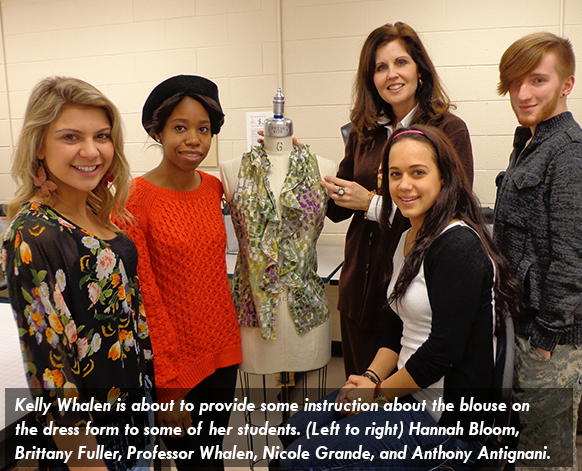 Kelly Whalen, the 2014 recipient of the award named for Hy, is an assistant professor in the CCM Visual Arts Department. Kelly’s relationship with CCM began in 2004 when she served as an adjunct professor. She was hired as an assistant professor in the fall of 2009. At CCM, she has been offered the opportunity to instruct students in all areas of design: architecture, interior design, fashion design, fashion merchandising, and her area of specialization – industrial design. Kelly received her formal education in fine art, graphic design, and finally industrial design, at Pratt Institute in New York City. Prior to attending Pratt, she was employed by Henry Dreyfuss Associates; while there, she obtained patents in agricultural (John Deere) as well as other industries. Kelly has always maintained a design consultancy providing services in various areas of industrial, interior, and graphic design as well. Her association with the MCMUA began in 2010 when she assisted a group of her fashion design students who were in the process of designing and making garments and accessories from recycled materials that were modeled at the 2010 recycling awards dinner. All of the students’ designs have been related to the dinner themes. The inclusion of the CCM fashion designers and their models has been the proverbial “frosting on the cake.” Above all, though, it is Kelly’s warmth, high level of energy, vast knowledge about fashion design, and the patience of Job, which has led to the appearance of some very creative and glitzy ensembles on the catwalk. 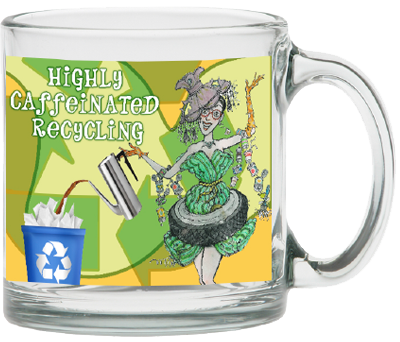 Kudos to the CCM fashion designers and models who have put their spin on “highly caffeinated recycling.” A special participant in this year’s show is Eileen Hladky, Chatham Township’s recycling coordinator whose avocation is acting. Eileen, hereinafter known as “Ms. Morris County Recycling Queen,” has been nominated for several Perry awards (they’re given by the NJ Achievement in Community Awards), and she has received one such award, the very first one for which she was nominated. 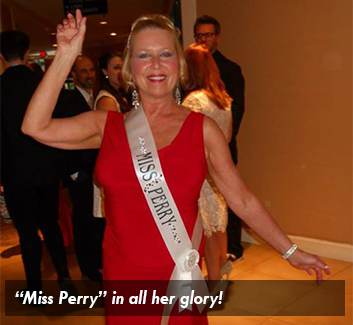 At the awards ceremonies she wears a “bling” sash bearing the title “Miss Perry” (code for Vanna White), and of course, she presents the awards to the winners and serves as general traffic controller. This evening, she wears an exquisite rhinestone tiara and carries a scepter, both of which symbolize her regal status in the acting and recycling realms. Once again, a creation by Leeza Tea Coco Chanel, the designer in residence at the MCMUA, is being modeled. For the mistress of ceremonies, Leeza Tea designed a tea length gown that is festooned with coffee filters (some used, some new). Donna Bangiola, a local designer, created the Queen of Hearts-style sleeves. The gown is accented with earrings and a necklace made with “petrified” moose droppings that were collected by a New England naturalist, and a run-of-the mill, but very trendy, stacked bangle bracelet. For the display unit, several members of the Morris Knolls High School Ecology Club have created a mural that is reminiscent of the “Pop Art” and “Graffiti” styles of art. Teachers Tricia Goginsky and Marlene Thalman supervised the students as they applied “Graffiti”-style lettering and “Pop Art” stencil-style images of bottles and cans (paying homage to Andy Warhol, Roy Lichtenstein, and Banksy) to the canvas. The blue and green colors impart a natural feeling, and the fire engine red text imparts an alert, wide awake feeling (think: highly caffeinated recycling), and somehow the overall effect is quite harmonious. By the way, the aforementioned artist named Banksy is quoted as saying the following with regard to personal fame: “We don’t need any more heroes; we just need someone to take out the recycling” (Wall and Piece, by Banksy, 2006, Century, ISBN 1-84413-787-2, p. 202). Rock on, Banksy! Okay then, Miranda McMua, who’s standing very close to the mural, has just said to the person writing this blurb that she’s feeling a tad neglected (she’s hypersensitive). Miranda is the MCMUA mannequin in residence. After aging slightly at Epstein’s department store in Morristown, which closed several years ago, she ventured to the MCMUA to live out her golden years. In 2014, however, she is adorned in a silver lamé blouse, charcoal tights (very, very dark silver! ), a silver skirt made from chicken wire that was left at curbside for trash pickup (aren’t we all recycling our scrap metal at our local recycling depots or at local scrap yards? ), and sneakers with sparkly silver-gray accents. Miranda is accompanied by Spike, her guard dog, whose “true rust” color is quite a contrast to all of that silver. Feeling better now, Miranda? Once again, Shot of Redemption is providing live music. To book these musicians for an event, call 845-255-3177. In 1983, Morris Plains resident Dan Goldman, who was a student at Princeton University, composed the song. In 1984, Anne Jones sang it on the Pat Boone Show, which was taped at Knott’s Berry Farm in Buena Park, CA. In April 1990, Dan sang it at a celebration at which the Morris Plains Recycling Center was renamed Reimer Recycling Center in memory of Fred Reimer, who recycled with the Boy Scouts early on and then later served on the Morris Plains Recycling Committee. And it was sung on other occasions by students at Mountain Way School in Morris Plains. Dan and Anne are here this evening to give it yet another whirl. The Birds & Beans® coffee – it’s for the birds! The coffee carried by Tomas and Noah Monteiro in the fashion show is shade grown, Bird Friendly® certified, Fair Trade certified, and OCIA organic certified. According to the Birds & Beans® website, “Every bean sold by Birds & Beans is certified by independent inspectors to meet the rigorous Smithsonian standards….Bird Friendly® coffee means that migratory songbirds we know and love have a better chance to survive while on their wintering grounds in the tropics….Dr. Bridget Stutchbury, author of Silence of the Songbirds, Yale Ph.D. and professor at York University says, the most important single step an individual can do to help stop migratory songbird population loss is to always buy certified Bird Friendly® coffee. Tropical habitat destruction is today’s biggest threat to neo-tropical migrants, and sun coffee is literally killing the birds we love. Today, almost all coffee on the shelves in the U.S. does not meet Bird Friendly® standards.” This coffee is available at Kings supermarkets, as well as online. The mission of the County College of Morris Foundation is to raise and manage philanthropic gifts for the benefit of the college, its students, and the community. To learn more about and perhaps then to donate to the foundation, which funds numerous scholarships each year, visit www.ccm.edu. 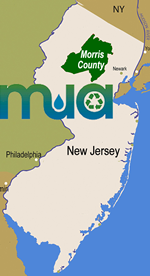 Of note: The offices of the Morris County Municipal Utilities Authority are now located on the CCM campus in the Dalrymple House at 214A Center Grove Rd., Randolph, NJ 07869. Here we are, enjoying dinner in one of the wealthiest counties in the United States. However, just recently, an article headlined “More Morris residents struggling to feed their families” was published in the Daily Record. Please bear in mind that we who are so very fortunate have the opportunity to donate non-perishable food or money to organizations such as the Interfaith Food Pantry, the Community FoodBank of New Jersey, and local food pantries. 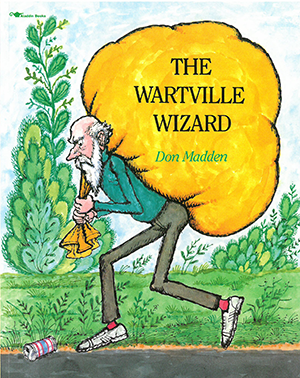 Don Madden, The Wartville Wizard, and the MCMUA – perfect together! Don is an amazingly warm, funny, and creative human being. Although he is unable to be here with us this evening, Tiya Madden-Cotter, his daughter (and the daughter of Jeanne, Don’s lovely wife), and Rich Cotter, her husband, are here in his stead. Welcome, Tiya and Rich!